This statistic contains data on the number of Americans without health insurance coverage from 2010 to 2017. In 2017, approximately 29.3 million people in the United States had no health insurance. Health insurance means that the insurer will either cover or reimburse the policyholder’s medical expenses in exchange for a premium. In the U.S. there are public and private forms of health insurance, as well as social welfare programs such as Medicaid and programs just for veterans such as CHAMPVA. 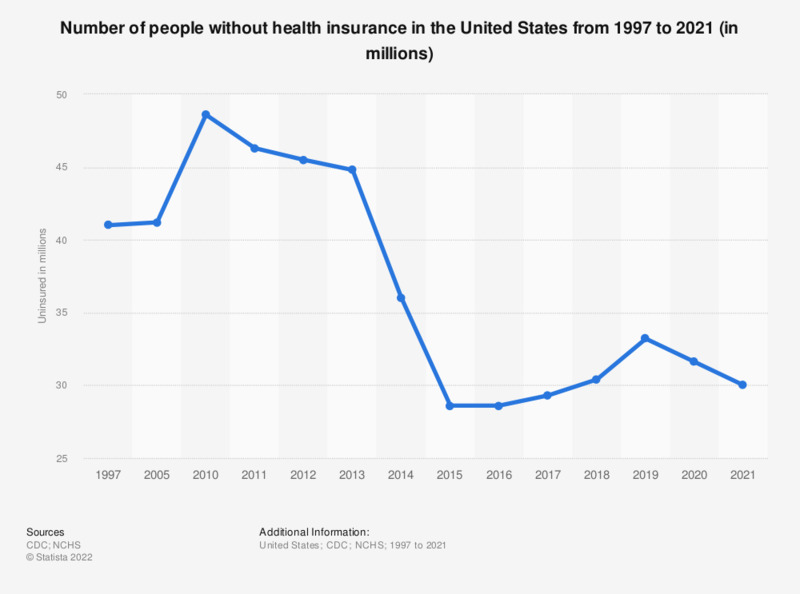 The Affordable Care Act (ACA) was enacted in 2010, which has dramatically reduced the number of uninsured Americans, though there’s still room for improvement. In spite of its success in providing more Americans with health insurance, ACA has had an almost equal number of proponents and opponents since its introduction, though the share of Americans in favor of it has risen since mid-2017. The number of uninsured people is higher in certain demographic groups. For instance, Hispanics continue to be the ethnic group with the highest rate of uninsured people, even after ACA. Meanwhile the share of uninsured white people is still lower than the national average. Everything On "Health insurance in the United States" in One Document: Edited and Divided into Handy Chapters. Including Detailed References. Statistics on "Health insurance in the United States"
Given what you know about the health reform law, do you have a generally favorable or generally unfavorable opinion of it? In your opinion, how large is the gap between the original concept and the implementation of the Affordable Care Act? How would you feel if the Affordable Care Act was repealed? Imagine Trump decided to repeal the Affordable Care Act – which of these statements do you agree with? What is your impression of the Affordable Care Act now that is has been in effect for almost seven years?